Moebius Models' Dragonfly is here! It's a kit for a 12-inch plane with a clear stand and decal containing the official show logo. Available at fine hobby stores and online retailers - get your copy now! See new images below. And for online reviews of the kit, there are reviews posted on YouTube which let you take a peek inside the box. Taken at San Diego ComiCon 2014. These models form an interlocking set; the complete scene is represented on the cover of the boxes. Scans and info courtesy of Dan Johnson; check his website for some examples of completed models. 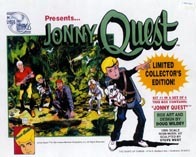 Sculpted by Steve West, based on a Doug Wildey design, and officially licensed by Hanna-Barbera. Cast by Matt McWhirt in 1994, originally as resin kits; later as cold-cast porcelain. The kits were released in the following order (numbers in parentheses indicate number of parts in the kit). Bandit (1) - This was a special collector's edition limited to 750 copies, and stood about 6 inches high. Here are some photos of the model from fellow JQ fans Terry Kelly, Louis Szabo, and several other sources. This link takes you to a page where you can see images of the full set of models, as built and painted by fans. Click on a boxtop image below to see a larger version. Dan also reports that included in the "Race" Bannon model was the following note giving tribute to Doug Wildey, who passed away in 1994. Select links below to see the images of the model kit contents as they arrived in the kits. As you can see, these models were high-quality items, with lots of attention to detail. Scans and info courtesy of Dan Johnson; check his website for some images of his completed models. Click on the boxtop images to see larger versions. 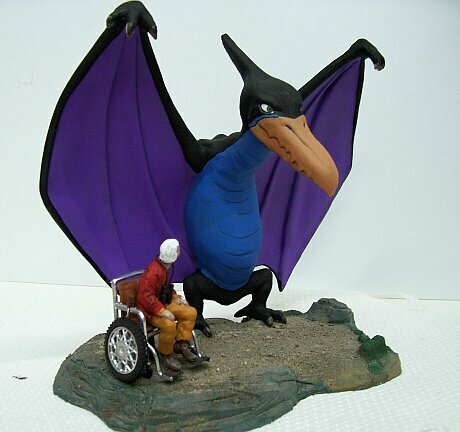 One creative fan added Turu's "master" in his wheelchair alongside! resin (with brass rods for the legs), sculpted by Dave Barkovitz, in 11 parts. Select this link to see several views of the model after it has been assembled and painted. Here are a couple of views of the Robot Spy model along with someone's scratch-built Parapower Ray! Awesome! Dave Barkovitz (Anubis Productions) wrote in to confirm that the above robot spy delivery craft was actually an Anubis Productions item. Dave also informed us that he had done an update to the robot spy kit's base, and sent in an image of the revised kit, as well as an image of the updated kit box. These are shown below; click on thumbnails to see larger versions. This one was originally sold by a company called "Monsters in Motion". 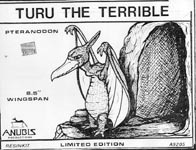 Unfortunately, as of 2009, the SST no longer appears on the "Monsters in Motion" website, so it looks like this is not available anymore; bummer! They are on the 'net at www.monstersinmotion.com if you want to keep checking or send them a note. UPDATE! June 2011 Dave Barkovitz (from Anubis Productions) wrote in to say: The SST that Monsters in Motion used to sell were also Anubis Kits, originally sculpted by Randy Cooper. He is still selling them at the moment: nurnys@yahoo.com. Select the following links for photos from the original set of web site pages for the model. Here are links to images to a completed and painted model. The picture on the left is the Amphibious Monster from "The Sea Haunt". 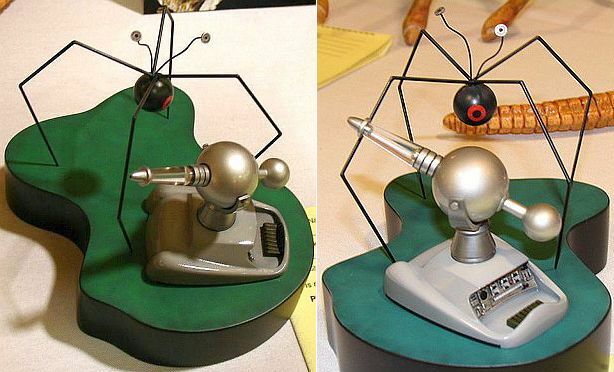 The pictures on the right are the "Robot Spy" Spider model from the episode of the same name. Note the scale of the model as compared to Hadji from "The Shape of Things" collection. Both models were built by Mark Klingerman, who provided the images and the information below. "The eye is a 2 1/2 inch plastic ball. The legs are 1/4 inch steel rods bent to the right shape. The antenna are made out of wire and 2 buttons. It measures 15 inches tall and 21 inches across." And, after a bit more conversation, Mark told me the tale of the two models you see here. 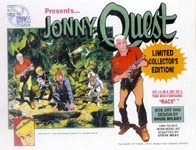 The Quest SST jet (aka the "Dragonfly" in "The Real Adventures of Jonny Quest"; in the Classic JQ episodes, it did not have a specific name, but was used quite a bit.) This is the plane seen in the opening credits in Classic JQ. Scans and info courtesy JQFC member Dan Johnson. Select image to see larger version. Scratch-built SST Here is another scratch-built SST model; originally seen on the auction site eBay, and accompanied by the following text: This huge, scratch built model has been professionally assembled and painted to scale and comes with a weighted removable stand. 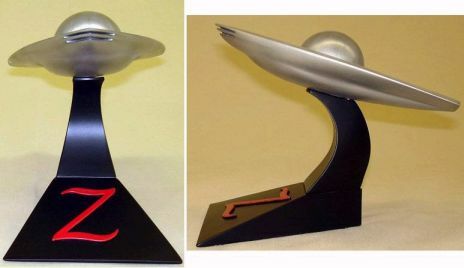 This model measures 22" long X 12" tall X 9" wide (with stand included.) It is made of PVC, acrylic plastic, polyester resin, fiberglass, aluminum and steel. Nothing about this model is flimsy. The front wing stabilizers and induction scoop are aluminum while the wings and rear stabilizer are made of acrylic. 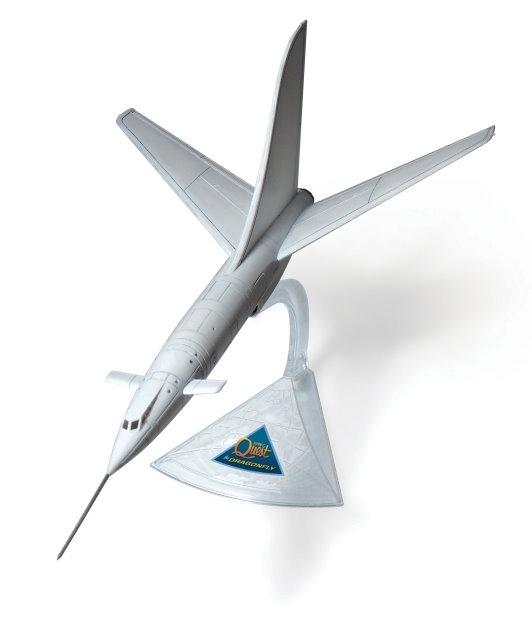 The nose cone is made of solid steel and the entire model has been fiberglass filled. The model has been painted with white and black enamel. The base is chromed steel circle that is covered with a shadow image of the plane in textured black plastic. An aluminum support arm easily holds the plane in place for show. The base also has a felt pad to protect any surface that it rests on. Select the following links for photos that appeared with the auction. Select image to see a larger version. There are apparently 6 figure sets in each volume, with quite a few volumes being prepared for release. 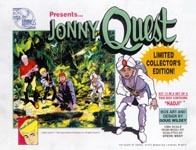 It is not known if any additional Jonny Quest character figures will appear. Images and info courtesy Jim Alexander. Made using the unreleased prototypes from Playing Mantis as a reference.